Setmore gives you the ability to consolidate multiple, duplicate customer profiles with the "merge customer" feature. Alternatively, if you want to clear away the clutter, there's also a method to select and delete multiple customer entries. We'll walk through both methods below. 1. Navigate to the Customers tab. In the customer listings column, check the box next to each customer whose profile you want to consolidate. A menu will appear in the main viewing area; click the option for "Merge Selected." 2. In the following window, use the drop-down menus to build the consolidated customer profile. Each entry will pull the original data from the profiles you selected in Step 1. 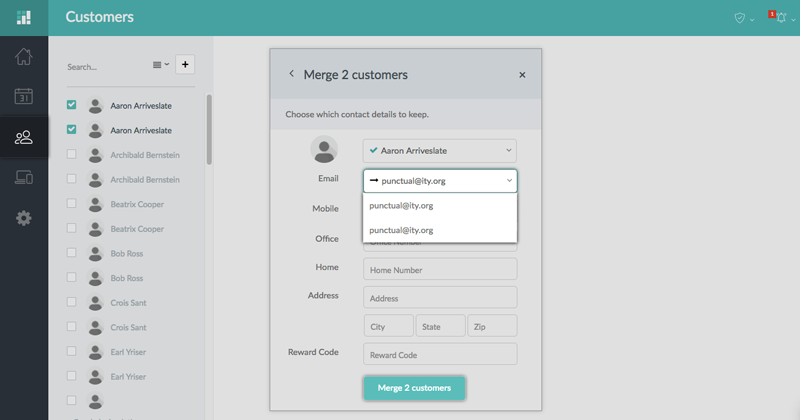 Click "Merge customers" to complete the customer merge. 3. You'll receive a message indicating that the merge is underway, and you'll receive an email once the merge is successful. Note that all appointment data and any notes in the customers' profiles will be combined, not deleted, into the resulting single customer profile. 1. Navigate to the Customers tab. In the customer listings column, check the box next to each customer whose profile you want to delete. A menu will appear in the main viewing area; click the option for "Delete Selected." 2. The following confirmation window will list all the profiles to be deleted. Click "Delete customers" to confirm the action.